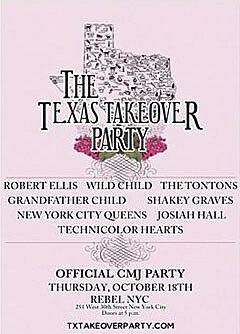 We’re happy to report that there have been a couple additions to our previously-announced Texas Takeover Party which happens on Thursday (10/18) at Rebel NYC (251 W. 30th St.) as part of next week’s CMJ Festival. Headlining the night (1 AM) will be Houston’s Grandfather Child. 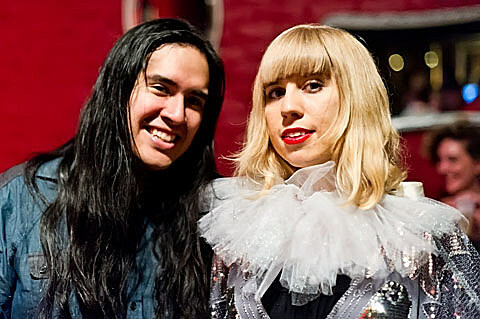 The band, who are signed to New West Records, count Robert Ellis as a member. He, who has appeared on BV many times, just happens to be playing a solo set right before them too. You can download both sides of Grandfather Child’s “Waiting For You” single at the top of this post. Grandfather Child are also playing a day party at Lulu’s in Greenpoint on Friday (10/19) afternoon, and, later that night, the New West showcase at The Living Room (11:30 PM) with Sydney Wayser, Kalen Nash, White Violet, Ponderosa, and Wolf Ram Heart. All Grandfather Child dates, including a December run that brings them back to NYC, are listed below. Additionally, Austin’s Technicolor Hearts will now open the party at 6 PM (get ready for a long night!). The band will also play Pete’s Candy Store later that same night (10 PM). You can stream their most recent EP below, and check out lots of live pictures of them on BV Austin. This is an official CMJ show and also FREE to the public with RSVP. Doors open at 5 PM, and we’ll have complimentary Tito’s Handmade Vodka while it lasts, and we’ll be giving out Mercy hangover prevention drinks all night. The folks at Mercy are also giving away CMJ badges, exclusive access to CMJ shows, a week’s worth of Mercy hangover prevention beverage and a chance to be Mercy’s CMJ Reporter. To enter, visit their Facebook. Hope to see you there! Meanwhile, for all things Texas, head to BV Austin.